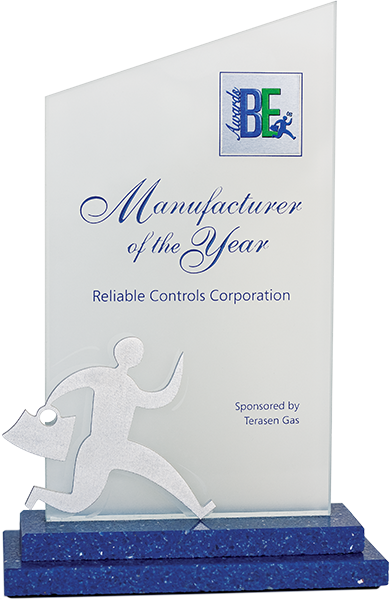 Reliable Controls was recently honored with a "BE Award" in the Manufacturer of the Year category at the 2008 Vancouver Island Business Excellence Awards. The award was presented in Nanaimo, British Columbia at the Business Examiner Magazine's 9th annual ceremony celebrating Vancouver Island business achievement and was received by the President of Reliable Controls, Roland Laird, and Vice President of Operations, Vince Palmer. As one of three finalists tagged for the award, Reliable Controls was considered best-in-class in the manufacturing field by a panel of four judges pulled from the local business community: Amrit Manhas, Information Analyst, City of Nanaimo Economic Development Office; Moira Jenkins, Vice President, Commercial Banking, Island North RBC Royal Bank; Kathy Lachman, Business Development Officer, Cowichan Region Economic Development Commission; and Dr. Pedro Marquez, Dean, Faculty of Management, Royal Roads University. The Business Examiner has been a prominent voice in the Vancouver Island business community for twenty-five years, reaching an estimated 85,000 readers with every edition, making it the most-read business publication on Vancouver Island.